Local star Alonso Lopez has made a surprise appearance at the top of the time sheets on the opening day of action at the Valencian Grand Prix, taking the provisional pole position from Marco Bezzecchi and Fabio Di Giannantonio. Setting his time in the second session of the day, both practices were well off the pace as heavy rain fell at the Ricardo Tormo circuit. A wet FP1 and a wet FP2 was the order of the day as the lightweight class machines completed their final Friday of the year in a rain-soaked Valencia. 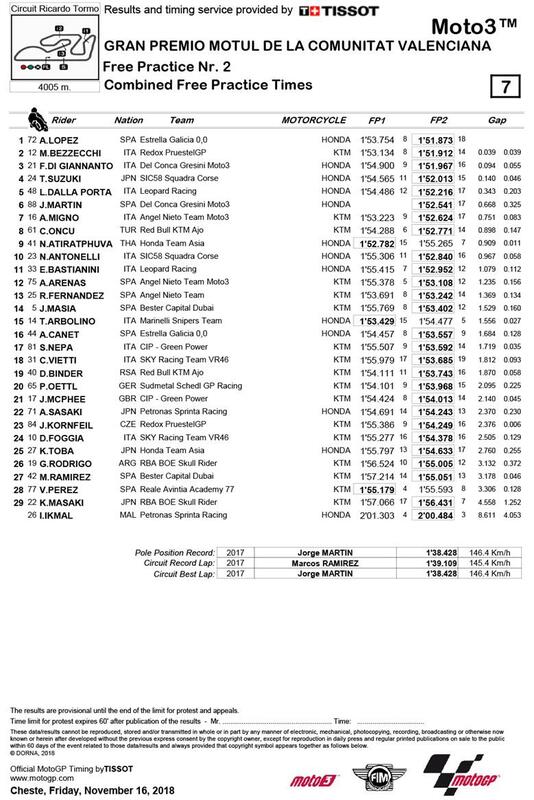 The aforementioned home rider Lopez takes the honours to top the two Italians, with Tatsuki fourth in a tight top four – 0.140 was the gap from the Japanese rider to the Spaniard after he ended the first session in 13th. Lorenzo Dalla Porta completed the top five on Friday. World champion Jorge Martin – who didn’t venture out in FP1 – ended the day sixth fastest, just ahead of Andrea Migno, who rounds out a solid day in seventh after ending FP1 inside the top three. Wildcard and Red Bull MotoGP Rookies Cup champion Can Öncü, meanwhile, took an impressive eighth to end his first day in Grand Prix racing in the top ten despite a crash, with fellow former Asia Talent Cup rider Nakarin Atiratphuvapat ninth overall. Niccolo Antonelli took tenth and was another who crashed in tough conditions. 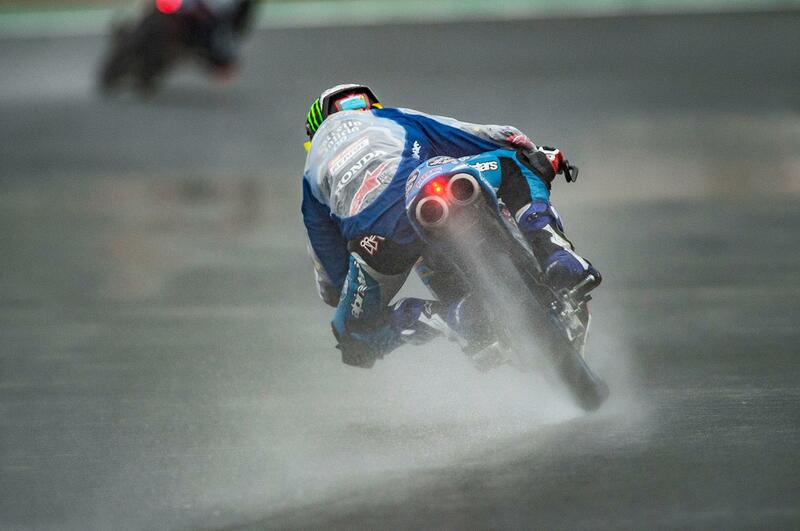 Crashes were aplenty in the wet conditions, with replacement rider Izam Ikmal the first rider to crash, joined by Tony Arbolino, Kazuki Masaki, Raul Fernandez, Vicente Perez for the second time of the day, Aron Canet, Bester Capital Dubai’s Jaume Masia and Gabriel Rodrigo – riders ok.